A few months back I was scrapping the bottom of the barrel when trying to level up my Botanist having less than a secure amount of Gils in my in-game currency. 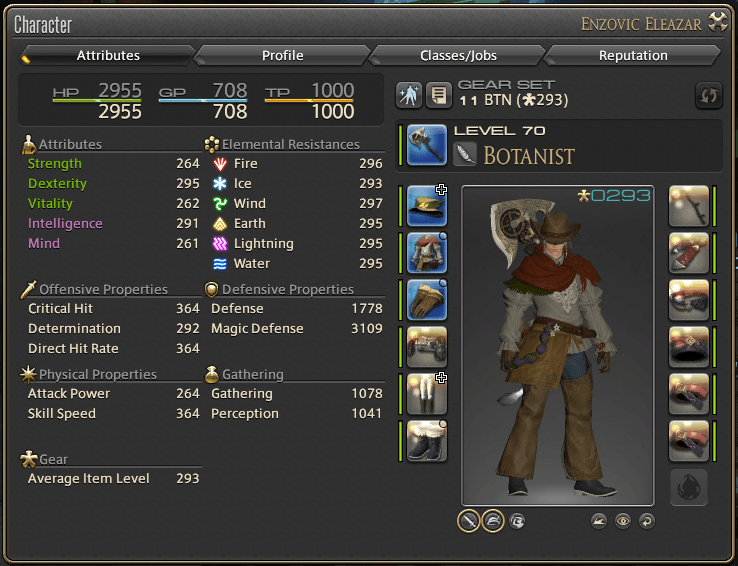 Today, my Botanist is fully geared at level 70 and I have over 1.1 million Gils in my in-game currency. I hit level 70 Botanist a couple of weeks ago and was simply having fun in-game that I have not posted any updates here about my Eorzean adventure lately. My lack of posting is a very good indication that I’ve found a game I like and I’m too busy to do anything else other than play. Now that I’ve completed my Main Story Quest, got my Botanist (money maker) to level 70, and I’m sitting on over a million Gils, I’m trying to slow down a bit, thus more time to post my adventures. This post is dedicated on how I make Gils as a Botanist. The beauty about MMO is that everyone has their own method of making in-game money depending on their style of playing the game. There are some who likes running dungeons, others like to craft, and there are those who like to gather materials. These are the 3 main drivers of the FFXIV economy. As an example; While players who run dungeons would demand food, the crafters in culinary arts will cook for them, while the Botanist will supply them ingredients — this is but one supply line. As a Botanist, I can supply materials for Carpenters, Alchemist, Culinary, and Weaver. Carpenters need logs to make lumber then they use the lumber to make shields, spears, and bows. Alchemist needs herbs to make potions and elixirs. Culinary needs a variety of ingredients for cooking such as fruits and vegetables. Weavers need sewing materials such as Moko Grass to make yarn, then use the yarn to make cloth so they can use the cloth to make gloves or cloth armor. So as a Botanist, I don’t have to gather material for each supply line, I can choose to specialize on which line actually in high demand. High demand = million of Gils. When looking at the Market Board, I always look at what other players are looking for, then I look at how much they sell for, how many stacks are being sold, and then how fast they sell. For example, if there’s a demand for Maple Logs (indicated by the heart symbol next to the item), I would click on it and see how much they are selling for. If it sells for less than 500 Gil, I don’t usually bother with it because the low price means that this item already has a steady supplier. If I go into that market, all I’ll be doing is undercutting everyone else who’s trying to sell their Maple Logs — at this point I move on and try to find a scarce item from the Market Board. Let’s say for instance there are only 10 listings of Maple Logs then by looking at the transaction history, they sell for 99 stacks every 10 minutes for 250 Gil per log. This means the Maple Log is moving at 24,750 Gil every 10 minutes or 148,500 Gil per hour. So even though it sells for less than 500 Gils, at 148k/hr, it is worth an hour of my time. However, in order to get that rate, I need to supply 6 stacks of 99 Maple Logs. The rate of gathering Maple Logs depends on my gear, thus having a top level 70 gear will help expedite the process. This is how I cash in from the investment of millions of Gils poured into trying to level up my Botanist. This is just an example, Maple Logs don’t sell for 250 Gils in Balmung, lol. After I’ve purchased all these gear pieces, I completed the rest of my gears with HQ level 70 gathering gears from the Market Board. The reason for this is Materia Slots. In order to get at least 700 GP, I need to use GP Materias and the Fieldking’s set does not have materia slots. So as expected, it requires a lot of grinding that sometimes I found boring only because of my level 63 gears — meaning I’m not getting the optimal amount per node. Since I didn’t have enough Gils to upgrade my current set at the time, I pushed through by simply gathering materials I can at my current gear level. Basically, I’m gathering 3-4 collectibles per node now that I can barely gather 1 before — that’s how tough it was before my current level 70 gears, before 1000 Gathering, 1000 Perception, and 700 GP. Gathering Materia IV (Guile, Guerdon, and Grasp) sells for 10k – 20k a piece. Blue Bobbit (Fishing Bait) sells for 10k – 20k a piece. Stonefly Larva (Fishing Bait) sells for 20k – 50k a piece. 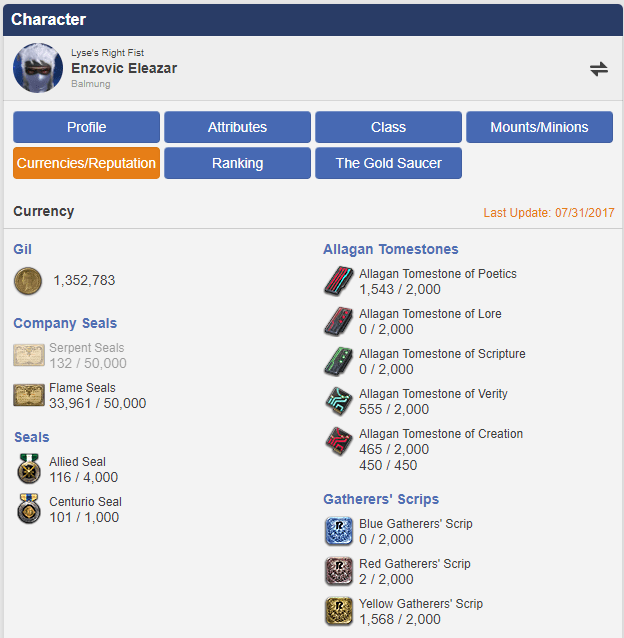 Everborn Athersand (Alchemy) sells for 20k – 50k a piece. Gathering Materia IV can be purchased using Red Scrips while the fishing baits can be purchased using the Yellow Scrips. So in order to supply these I need to gather collectibles to exchange for scrips. For Red Scripts I gather Lotus Root and Bamboo Shoots. For Yellow Scrips I gather Rhea, Othard Plums, and Jham Ginger. The Everborn Athersand comes from Torreya Branch which only spawns once a day (Eorzean Day) in the morning. Selling 10 of each will net for 100k – 200k Gils easy. If the supply is scarce and the demand is high, the baits can sell for 50k a piece which can net over a million of Gils. 12am/pm – I gather Rhea, a node will only spawn after using Tome of Botanical Folklore – Othard. 2am/pm – I gather Othardian Plum, a node that is very close to where Rhea is. 4am/pm – I gather Jhammel Ginger. 4am – I gather Torreya Branch, then use Aetherial Reduction to get Everborn Aetherialsand. 6am/pm – I can gather Hallowed Basil depending on demands, else I skip this. 4 – 8 typically is the time I browse the Market Board to see how much the supplies are selling for. 8am/pm – I gather Lotus Root in Doma. 10am/pm – I gather Bamboo Shoot, a node close to Lotus Root. At the end of an Eorzean day, I’ll have at least 3-5 collectibles that I can exchange for scrips. Depending on how much each item is selling for, I’ll purchase the item and post it on the Market Board. Even though I have over 1000 Yellow Scripts right now, I do not flood the market with fishing baits because it will only drive the price down. Of course, there are many players who do not understand the economic principle of scarcity and flood the market anyway — for which, everybody loses. Why? It is because the high quantity of bait drives prices down, then fishermen who can buy more baits will catch more fish that will, in turn, drives the price of fish down, then affects the culinary market, etc, etc. In the end, when someone undercuts everyone, they are hurting the economy this is why botting and sweatshops are frowned about because they do not respect the in-game economy. Right now the economy is a bit stable but the prices went down for a while due to players flooding the market with supplies. I’ve never had over 1 million Gils before so this really makes it exciting for me. I might even get my own house, hmm, it would be nice — if there’s any empty house left that is.